I had decided early on that this would be my week of exploration. I was feeling better – my head cold was mostly vanquished – and my friend, roommate, and work colleague, David was away on an adventure of his own. The week got underway with another trip to El Hub Oaxaca to get my membership sorted; 250 pesos for thirty hours. I figure that’s enough time to give working here a try. The space is huge and lovely, and the other El Hub members are all doing interesting work. Later in the week, Gregorio corners me to ask that I translate my El Hub member profile from English into Spanish. I’ll need to wait until David’s return for this task, as my Spanish has suffered from a year-and-a-half of not being used. I’m invited by Jena to join a few people for drinks and snacks at the hip-and-trendy Comala. 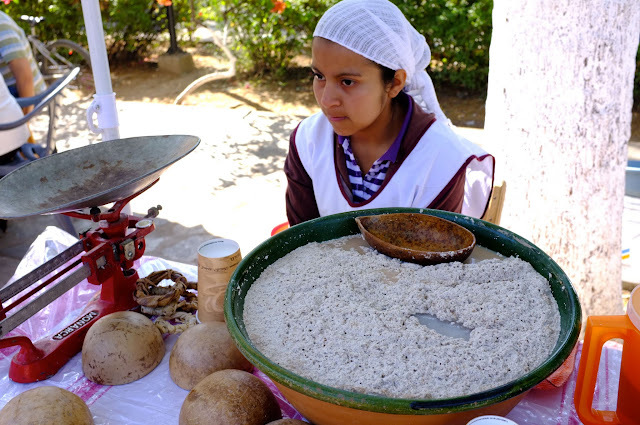 The small gathering quickly expands into a large boisterous group, several tables in size, as more and more people show up – it’s clear that everyone knows everyone in Oaxaca. It’s a great night: I meet a bunch of new folks, including the dry-witted Rodrigo, who I’ve run into almost daily since. Having lived here a long time, I pepper Rodrigo with questions. He’s humorously obliging. My number one question: bikes!? Where the hell to find them, preferably used? I mean, what exploration of a city is complete without a bicycle between your legs? This is a question that confounds even the most die-hard Oaxaca residents. I wonder aloud where all of the old bicycles go, but nobody has an answer. Rodrigo recommends two shops, Zona Bici and Bicimundo, and while doing some research for this post I find that there are at least another three shops in town. I don’t quite find the time to tour the bike shops this week, so I add it to my list for next week. The next exploration is coffee shops. Having thought that I was allergic to caffeine, touring the coffee shops wasn’t that high on my list, but I give in to the gravity of habit and decide to check out the bohemian scene. I manage to visit Lobo Azul (the same place that hosted the forum theatre group) and Cafe Brujula – both lovely, spacious, comfortable spots with good, strong espresso – the next two on my list are Nuevo Mundo and Cafe Los Cuiles, the later which is supposed to have great food also. What naturally follows coffee? Lunch, of course. As far as lunch places go, and there are many – lunch is a big thing in Oaxaca – my current favourite is El Biche Pobre for the “La Botana Oaxaquena,” a big plate of mostly deep fried awesomeness. There are many, many others, mostly small nameless places, that all have their own version of the “comida corrida,” a set lunch menu that leaves me ready for a nap every time. Then came the exploration of the outdoor markets. These tend to happen on Fridays and Saturdays throughout the city. The first one I stumble on by accident is an enormous market surrounding Parque Llano with a bazaar-esq feel to it: little portable restaurants with large communal tables that are elbow-to-elbow with people eating tasty treats, rambling produce stands, clothing, electronics – you name it, it’s here. 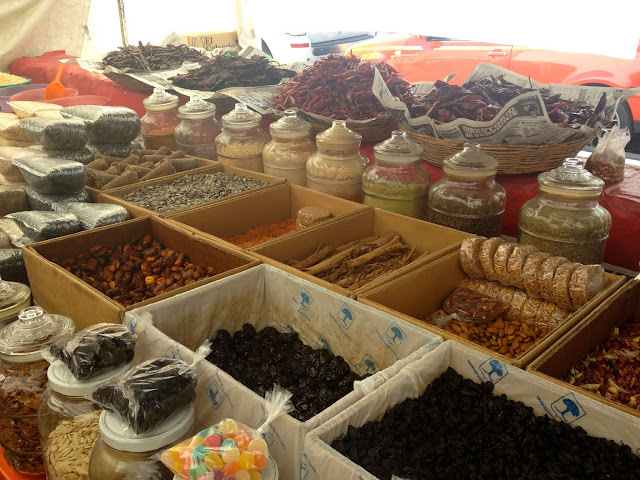 On Saturday I tackle the outdoor organic market in Xochimilco, that sits just in front of the Iglesia de Xochimilco. This is a great spot for breakfast, lots of little stands serving strong organic coffee and various other breakfast goodies, and – to be honest – some of the best cheese I’ve had in my life. While waiting for today’s variation of corn tortilla with unknown stuff inside for breakfast, I meet Vivian, an American who is here writing a book. She is by no means the first American author in Oaxaca I’ve met. It’s either something about the air here, or something about the history of uprising and resistance in Oaxaca, that seems to attract all of the world’s lefty writers. It’s a good thing that I like lefty writers. The weekend wasn’t complete without a lazy Saturday afternoon rooftop soiree hosted by the ladies of Pro World, Teresa and Blaze, and deejayed by the ever-entertaining Scott. The music and conversation continued well into the evening, and it was a superb vantage point to watch the sun set behind the mountains that surround Oaxaca city. I ended my “week without a room mate” with the realization that, in Oaxaca, flying solo isn’t really flying solo at all.